A new initiative to get impaired drivers off the streets was launched in Portage la Prairie on Monday. Report Impaired Drivers 911 allows citizens to call 911 if they suspect an impaired driver on the roadway. Portage is the second Manitoba community to have the initiative after Brandon launched theirs last spring. 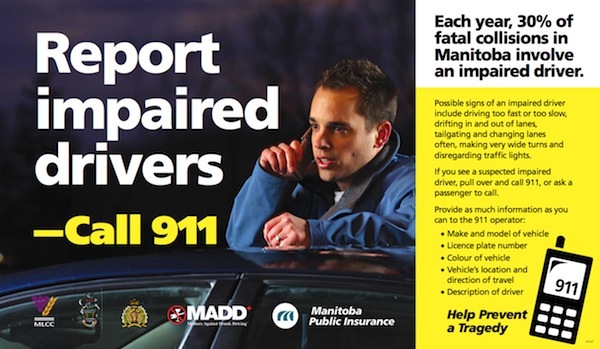 RID 911 will be administered by the Portage RCMP, in partnership with Manitoba Public Insurance, the Manitoba Liquor Control Commission, and MADD Canada. More than 70 communities across Canada have similar campaigns.